This illustration was commissioned by the New York Times Magazine, but never published. They used a photograph instead. 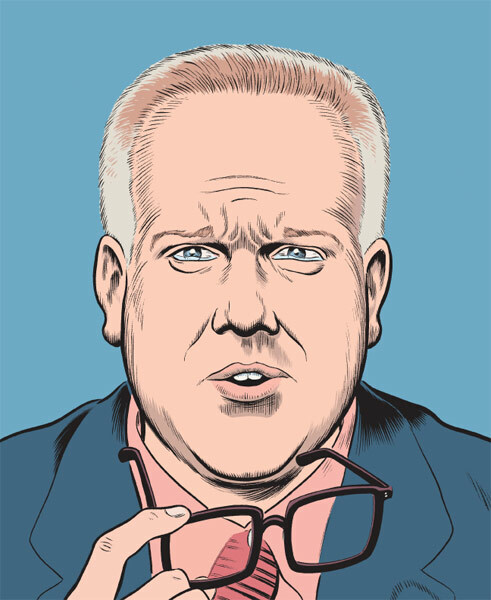 CLOWES: I was asked by the NYT to draw Glenn Beck for the cover of the Sunday magazine - apparently, he wasn't going to sit down for a photo-shoot with the Times and so they had to hire an illustrator for their big profile. I had been longing to draw his blubbery face for some time and happily agreed. I turned in the illustration on a Monday and was told that Beck had in fact agreed to come in and sit for a photo over the weekend, so they couldn't use my illustration. Thanks for telling me. The B&W photo they used was perhaps a bit more complimentary to Mr. Beck, so I'd say he made a good call.